Most of you are probably in between the “Charge $50” and the “What the Hell Happens Next” stage of business. Maybe you’ve upped that $50 session fee to a *gasp* $150. Maybe you’ve convinced yourself that you only want to offer mini-sessions because those are the only ones where you can make a profit (30 minutes for 4 8x10’s, right?). Most of you have convinced yourself that you’re not good at selling so you’ll probably only ever be a shoot-and-burn photographer. Has the lingo caught up with the modern version of this? Perhaps shoot-and-upload? I will let go of any preconceived notions I have about selling as a photographer. I will let go of any assumptions I have about what my ideal client or market can afford to spend on photography. I will begin to separate my worth from my craft. Ok, so now that we’re all here together let me point out some major wowza facts for you. Prior to switching up my technique with my clients (aka when I was only ever making $75 a pop) I was barely scraping by. But once I made the shift to putting my clients first and truly understanding how I could better serve them...things went bananas. Some will call this strategy In Person Selling or IPS. But I kinda hate that phrase. I truly never believed I was selling anyone anything. I was creating an experience for them. A journey. I was showing them the value of why they should and needed to invest in photography. And not only photography, but collateral. So for the sake of clarity let’s redefine this. Can we all agree that shoot-and-burn (or upload) is a 100% valid way of running a photography business? Heck, even my own family photographer of choosing today uses this method. Let’s call this the SAB Method. The method I want to teach you today takes it further than that. It only incorporates a few additional steps and touchpoints, but the pay off (and satisfaction) is huge. Let’s call this the VIP Method. The $525 was made up of 7 different sessions from 2 different clients. The $7,300 was made up of 2 different sessions from 2 different clients (neither were a wedding). To demonstrate the difference in these two experiences (and why you can make a helluva lot more money by utilizing the VIP Method) I’m going to breakdown how each of them look step-by-step. 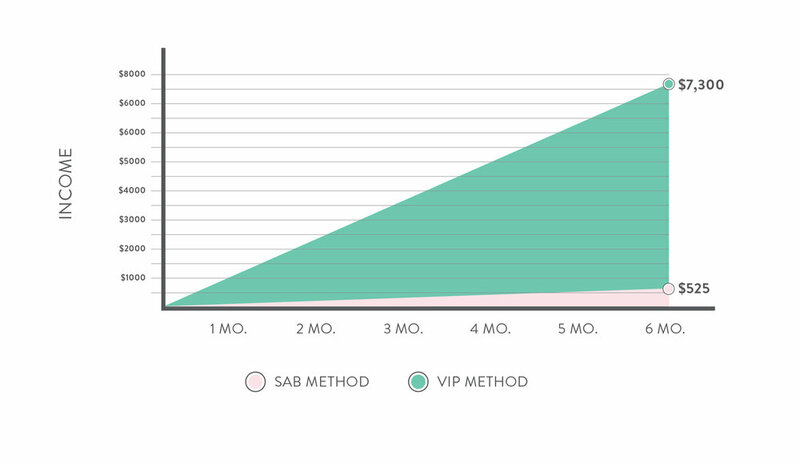 You can see that the VIP Method has only 5 additional steps to the entire process from start to finish. So let’s break those down. Here are the main differences between the VIP Method and the SAB Method. You can see that one of the first differences right off the top is that within the SAB Method the client is the one to set the tone of the entire experience. When left unguided, a client can get particular. In my experience (and I’m sure you’ve seen this too!) is that my SAB clients (those who paid less and got less) were my most difficult and needy. We’re talking 7+ outfit changes in one session. Backdrops, chalkboard signs, balloons, location changes and more. But I allowed that to happen. If we don’t step in as the expert that we are to set up the expectations the client will take over. As soon as I switched to the VIP Method and set up those prior expectations early and often the entire process went smoother and my client was happier. I began to get firm on what days I shot, what time I would shoot and how long the session would last. These were non-negotiable so my clients didn’t even budge. It’s as simple as changing your lingo from a question to a statement. “What time would you like to meet?” turns to “I only shoot at Golden Hour so we’ll need to meet right at 6:30 to take advantage of our time together”. You can see that within the SAB Method there is a big disconnect between the session and the end result. The client is often left to wonder if there were any good shots captured, how did they look, was their kid covered in snot the entire time? The thread of excitement didn’t continue from session to delivery. This method gets the client involved in the process in a way that still has you in the driver’s seat. It’s getting them excited and expecting to buy more later. Where do they buy these things you ask? In this VIP Viewing Session. Although this kinda exists in the SAB Method it’s definitely not VIP...it’s simply a viewing session. The SAB client views their gallery alone. On their computer or most likely their phone. Without you there. Lame sauce. The VIP client has a complete additional experience to see their images for the first time. This is where the magic happens. There are a few key things I want you to note here in order to make your first Viewing Experience amazing. The purpose of those stipulations is that you’re creating a high-end, intimate, grown-up, viewing experience. Everyone involved knows that there will be money spent in these sessions so the tone needs to be right for that (that’s why no kids!). So now we’re in the Viewing Session. Dessert is getting eaten, wine is getting drunk and mom is tearing up over the gallery you’re playing on your iPad. Right on schedule. As the client is viewing their images, try to make a note of which one she’s particularly ohh-ing and aww-ing over. After they watch your slideshow once go back through it again and pause on the images you deliberately captured for that gallery wall she talked about putting above her dining table. Show her the options for that gallery wall. Does she want to go with canvas or prints in frames? Awesome. Walk over to the dining wall with her. Let her know what size you’d recommend getting in that canvas due to the size of her wall. Awesome. Now, let’s pick out what the other images are that will surround this staple piece. Notice that you are expertly guiding her through what choice she should be making. Remember that you are the expert here! You know what sizes images need to be. You know how small an 8x10 looks on a 2-story wall. You know that gallery wrapped canvases look better than foam mounted prints. Your client is trusting in you, the expert, to tell her what to do and what to get. Every buyer innately needs this guidance. It’s your job to provide it. And if you do it right, the pay off will be great. To complete this process you simply need to collect payment, order their products and get them in your clients hands. Those four steps that I outlined above are absolutely crucial to creating a true VIP Experience for your next client. It will be the thing that can enable you to 30x your client spend. But it not only brings in more money, it brings a better experience. For the client and you. The fulfillment I, as the photographer, would get when I started offering the VIP Method vs. the SAB Method was tenfold. I began to find more joy in my work. More purpose. More drive. I challenge you to make these simple tweaks in your process for your very next client. And let me know how it turns out for you. Come back here and leave a comment with your results or questions. Loved these actionable takeaways? Join our exclusive Facebook group made to help you book out your photography business. By sending branded, beautiful emails your potential client or customer continues to get to know you better. They generally like you more. And they definitely are more likely to trust your business. Find out how to turn that trust into a sale here. Nurtured leads make 47% larger purchases than non-nurtured leads (source). Hello, why wouldn’t you nurture them then? That’s like throwing away free money. How many times have you stumbled upon a gold mind only to forget the name, lose the address or fail to save it for later? Trust me, people who come across you will accidentally close a tab, won’t bookmark the page or restart their computer in the middle of reading no matter how awesome they think you are. If you can manage to capture people’s information then they are way more likely to remember just how amazing you are. Email marketing is one of the only ways to guarantee your entire audience will be exposed to you. Social media is not guaranteed and posting a blog post all by itself is like a shot in the dark. Email marketing forces your name to show up in their inbox again and again! As much as we would like to assume people magically show up on our email lists the first step to any marketing tactic is to grow your exposure. You can organically increase traffic by creating killer content on a blog (you stopped to read this didn’t you). Here are some surefire ways to increase traffic on your website. And this includes some super simple SEO tactics to help push your company to the top of search engine results. Before you begin collecting email addresses, you need a way to capture this information. Here is a basic step-by-step tutorial to set up your forms in Mailchimp. Do you willy nilly give out your personal information? Absolutely not! You have to trust someone, and they have to give you a pretty legit reason for you to hand over that coveted email address. The secret sauce to having someone sign-up is using a super valuable opt-in. You can learn all about what goes into one here. Or if you just need a gold mine of ideas. I have 101 irresistible headline ideas waiting for you in my FREE e-book. Snag your copy back stage. So you finally have a list of people dying to hear more from you because you already gave them some of your juiciest knowledge. But what do you send them? What goes in your “newsletter” of sorts? Personalized emails improve click-through rates by 14%, and conversion rates by 10% (source). Consider adding someone’s name to your subject line and addressing them in your email. In Mailchimp you simply do this by adding the tag *|FNAME|* which refers to that field on your list based on the email address. People want to connect with other people. They get plenty of “ads” in their inbox from big box brands. Don’t spam them. Act like they are a part of your life, you have them over for a cup of coffee and you want to tell them a story. Connect it back to something going on in your life or business. Give your readers something to do. Perhaps you challenge them. Maybe you ask them to read something. Go and sign up. You can even ask them to buy (don’t do this every time or you will wear out your welcome). Always end your emails with a call to action. It is completely appropriate to throw in some extras at the bottom of your email. Consider adding some of the follow items. Blog Posts – What is your newest content you don’t want them to miss? Social Media – Where do you like to hang out online? Promoting Products or Services – What is available to them right now? When it comes to social media schedulers it seems that it’s usually a bit of a piecemeal to get all the functionality you need for your business. The terms of service for each platform varies so much that it’s hard for one scheduler to be an “all-in-one”. So, while we still use and love Later for our Instagram scheduling, we haven’t really been in love with our options for posting to Twitter and our Facebook group. When we were voicing our frustrations with our options someone in a Facebook group suggested we check out Post Planner. Holy Moly, were we impressed! First off, it’s $2.00 a month cheaper than what we were using (#DollaBills y’all) and it had some unique features that we didn’t even realize we were missing. If you’ve been considering Post Planner or if you already have it, but not quite sure how to use it, then read below for a full tour of our favorite features. WHAT THE HECK IS POST PLANNER? And more importantly, why do you need it? Social media can be tricky, and it’s hard to be active on all the platforms during the day without it sucking up your entire calendar. So it’s nice to have your posts scheduled out in advance so you stay on top of your social media game. Heck, anytime we can get a robot to do our work for us we’re going to do so. Basically, Post Planner allows you to plan and schedule content to your Facebook Page, Facebook Group, and Twitter. Starting at just $7 a month for up to 10 profiles, 100 posts per day and 1000 planned posts it’s a clear winner over other apps like Buffer that cost $10.00 a month and only allow 100 planned posts a month. We’ve been able to link our Twitter and Facebook Group so we can plan out content to our hearts’ desire, which frees up a ton of time on our part. First, you’re going to want to create your account. We chose to sign in with our Facebook information to make life easier, but you can create an account with your email (you’ll need to sign in to Facebook to connect your Facebook page or group though). The first tab you’ll land on is the “Find” section. This one is both cool and lame at the same time. It’s cool because it lets you browse various categories such as “marketing”, “business” or “quotes” and related articles or statuses will pop up. We use this feature solely to get ideas on what to share, write ourselves, or just for inspiration. We don’t share these actual articles because we don’t know who they’re coming from. We like to support people we know in real life (even if just virtually) so we hope that they work on this section a bit. It would be nice to be able to load up accounts you actually follow to see what they’ve been sharing with the ability to re-post it within the app. So you can skim over this section if you want to. We will point out though that the reason why this is neat and we hope they integrate it differently is that it’s super beneficial to share others’ content. It helps provide a smorgasbord of related and valuable content to your audience without it just coming from you. Sharing Karma is a real thing, y’all. If you did feel inclined to share from this “Find” section, you would simply click on the article and up would pop your share box. We’ll go over more features of this share box below. The next tab you’ll see is the “plan” section. You can set your default posting times in here if necessary. Say for instance you never want things to post on a Tuesday (weirdo) you would simply click on Tuesday to gray it out (similar to how Saturday and Sunday look). We chose not to set default posting time because we knew we were going to override them elsewhere. More on that below. Okay, this is where it gets fun. Here is what our “Post” tab for our Facebook Group looks like. One of the features they have here, called the “Recycle”, is hands down the reason why we love this app. What it allows you to do is set a specific post to “Recycle” at a time you designate. We’ll show you how in just a bit. Here’s how that’s different than what Buffer can offer you. Say you want the same Facebook Group prompt to go out every Tuesday at 9 a.m. Well, in Buffer you could schedule in to do that once and save it to your library, but every week or so you’d have to drag it from your library to your Tuesday spot. If you placed too many of the same post (if you wanted to pre-scheduled out Tuesdays for the rest of the year for instance) Buffer would stop you. No bueno. Another cool thing we want to point out is that if you click on the “Posted” tab you’re going to see all the things that have already gone out. From there you can click on previously posted items, edit (if needed), and repost. This is similar to Buffer’s library, but way more simple. Here’s how our Twitter feed looks. You’ll notice that we have “Recycle” on every single post here too. What we were finding with Buffer is that since you could only pre-load 100 posts at any given time then we could only schedule so far in advance. That only lets you schedule 3 posts a day on Twitter per month (not counting if you have anything set to your Facebook Page or Group). Three posts a day on Twitter is not enough, folks, so we need more. With Post Planner’s intro package you can have 33 posts a day on Twitter (whoa) or roughly 10 to 15 like we have because we also account for the posts we have planned in our Facebook Group (to reach their 1000 limit per month). Here’s scheduling a tweet in action. We only plan for blog posts to be shared inside Post Planner. We have a IFTTT set up to post our Instagram posts to our Twitter as native posts (i.e. not an Instagram push, but a true Twitter post with an image). So we’re either sharing and repeating our own blog posts or the posts of people we love. So here we’ve simply copy and pasted the direct URL to a blog posts of ours. Don’t worry about how long the link is, Post Planner automatically turns it to a bit.ly for you. The image that we have on our post automatically loads as the image to share (tweets with images perform better than tweets with just words). If we wanted to add more words we could, but we like to keep it simple (also, #Lazy). You’ll see that we check “show Sharebar when link is opened” - we’ll go over that in a bit. Now, let’s plan this sucker. If you click the “Add to Plan” it will pop this tweet up in the next open spot in your queue. If you click the drop-down arrow you’re going to get some more options. From here you can decide to share as your next tweet no matter what is scheduled, share right now, or to schedule. When you open the “Schedule Post”, this is where the magic happens. You can set the exact time you want to schedule the tweet and select it to repeat if you wish. We select all of the blog posts we share to repeat, because we are very picky about what we share, so since we know it’s valuable we know you’re going to want to see it again. Once you decide to repeat a post you can change it to repeat every # of weeks, days or months until a certain end date or for forever. WHOA. Think of all the possibilities! Once you pick your repeat plan just hit “Schedule”. Now, your tweet will show up in your queue with the bit.ly that Post Planner gave it (feel free to make your own custom bit.ly in your bit.ly account, but this is just an extra step). You’ll also know that the “Recycle” is on because you’ll see the grey recycle icon on the left. If you hover over the tweet, this purple bar will come up. This is your chance to edit, delete or re-schedule. You’ll only need to re-schedule if you didn’t select it to repeat forever. Oh, one other cool feature is that you can open up Canva directly inside the app if you don’t have a cute graphic to share. In-app friendliness is kind of our jam. Okay, now let’s talk about what the heck the Sharebar was all about. It’s pretty much our favorite feature ever. So you know how when you share other people’s content you’d kinda sorta like to get them back over to your site too? Well, this is where Sharebar comes in. When you share a blog you can enable the Sharebar to show and this is what it’ll look like. Here we are on Megan Minns’ website and our information is showing at the top of her webpage. It doesn’t block anything she already has going on it just simply reminds people who sent them there and enables them to head back to our website, Facebook, and Twitter account. If we wanted to show an email opt-in we would need to upgrade to the Guru plan at $15 a month (not bad at all). In order to enable your Sharebar you have to create it first. You can find the information on how to do so in your Post Planner settings. We hope this walkthrough gave you some insight into how powerful this app can be for your business. Now get to scheduling, babe! Create your account with Post Planner now. Instagram is Our Main Jam!